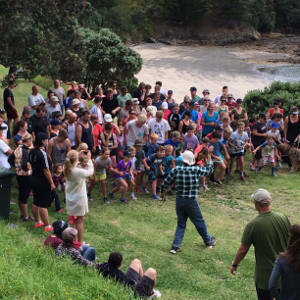 Don’t miss the big race on New Years Eve, be down at Sandy Bay at 8.30am. Run or walk, it'll be fun and there are prizes aplenty. Organised by RRA and sponsorded by Colin McLaren of Rakino Olive Groves. The other thoroughly dampening experience of the New Year will be the Dragon Boat Race, usually held in the first few days of the new year. RRA invites you to come to the Home Bay ramp and enjoy the fun. 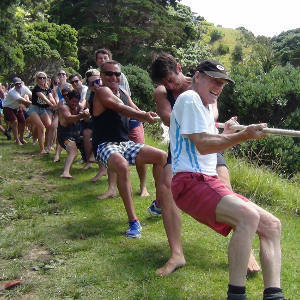 New Years Eve we have all the usual beach races, culminating in the Grand North-South Tug-of-War. Can the North pull it off next time? 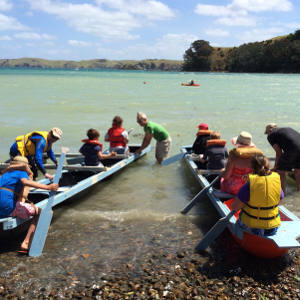 Rakino Ratepayers Association Inc (RRA) is set up to conserve, promote and advance the interests and welfare of the Rakino Island Community and to represent their views to Auckland Council and other interested parties. In addition, RRA assists the social amenities on the island, promotes and provides a channel for communications for appropriate transport, is involved in improving communications and the environment. Property owners on Rakino are encouraged to join RRA, an incorporated society with an elected volunteer Committee. You need a voice when it counts to ensure that your property and the island of Rakino can continue to be enjoyed to the full by generations to come. Communication with members is generally via email. Regular e-Newsletters from the Committee are published to keep everyone abreast of what's happening on the island. There’s also a traditional outbreak of highly competitive family-oriented activities over the Christmas holiday period, which the Association proactively supports and promotes… We’d always like to do more, with your support! You can join RRA at any point in the year by completing a membership form and returning it to the Secretary with payment. RRA’s financial year runs from July 1st to June 30th, with an AGM in October over Labour Weekend. Rakino Ratepayers Association is a Registered Incorporated Society. The RRA Constitution (PDF) was last revised in 2014. It explains in detail the functions of RRA and membership.